The Texas Examinations of Educator Standards (TExES) Health EC-12 exam is used to evaluate your requisite knowledge, skills, and abilities as an entry-level EC-12 health educator in Texas public schools. Teachers in Texas public schools must adhere to strict educational standards to maintain a high quality education for all Texas students. The TExES exams were designed to allow for the standardized assessment of these precise standards. Please note: in addition to meeting other eligibility criteria for teachers in the state of Texas, you may need authorization from your teacher preparation program prior to sitting for the TExES Health EC-12 exam. Make sure to check with your educational program before registering to take the exam. How much does the TExES Health EC-12 test cost? The TExES Health EC-12 exam costs $116. You can pay by credit or debit card when you register to take the test online. Your registration will remain valid for up to 170 days from the date of registration. If you allow your registration to expire, you will not receive a refund. If you need to cancel your scheduled test, you must do so at least 48 hours in advance. You must also submit a withdrawal request in order to receive a refund, from which $25 will be deducted. What is the passing score for the TExES Health EC-12 exam? The passing score for the TExES Health EC-12 exam is 240. You will receive your official score within 7 days of the test. These dates are determined by the date on which you take the exam, so check the TExES testing website for specific information. Should you receive an unsatisfactory score, you must wait at least 45 days to retake the exam. Certification exams are limited to five attempts, so keep this in mind when preparing for the exam. What does the TExES Health EC-12 exam cover? The TExES Health EC-12 exam is a computer-administered test (CAT) consisting of 100 multiple-choice questions. Of the 100 multiple-choice questions, some may function as unscored pilot questions, which are used to determine the questions’ usefulness in future tests. You will not be able to distinguish between scored and unscored test questions, so try to answer each question to the best of your ability. You will be allotted 5 hours to complete the entirety of the exam; 15 minutes are given for the CAT tutorial, and 4 hours and 45 minutes for the actual test. By now, you should have a better understanding of the associated fees, general content, and basic structure of the TExES Health EC-12 exam. What comes next? The most effective means of ensuring your success on the TExES Health EC-12 exam is to thoroughly prepare using the most reliable test preparation materials on the market. 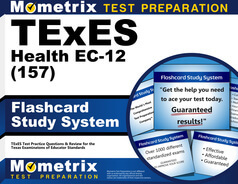 Mometrix Test Preparation has everything you need in the comprehensive TExES Health EC-12 (157) Secrets study guide. The TExES Secrets study guide includes authentic TExES Health EC-12 exam material and expert tips designed to help you recall information, lower test anxiety, and pass the TExES Health EC-12 exam on your first attempt. Along with the TExES Health EC-12 Secrets study guide, Mometrix Test Preparation also offers a complete TExES Practice Test, and a comprehensive set of TExES Flashcards. Read the TExES Health EC-12 (157) Secrets study guide, assess your knowledge with the TExES Flashcards and TExES Practice Test, and take the right path toward becoming a Texas public schools health educator. The sooner you pass the TExES Health EC-12 exam, the sooner you can earn your credential and beginning teaching in Texas public schools. Mometrix Academy is a completely free resource provided by Mometrix Test Preparation. If you find benefit from our efforts here, check out our premium quality TExES Health EC-12 study guide to take your studying to the next level. Just click the TExES Health EC-12 study guide link below. Your purchase also helps us make even more great, free content for test-takers.